Rich Rigsbee, grand prize winner of the 1929 Model A Car OR Cash Raffle, accepts the key for the donated vehicle from TAC CEO Justin Debord. 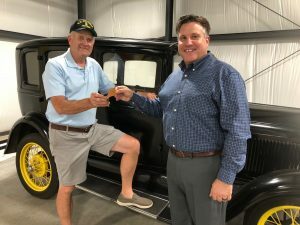 TAC ended a months-long campaign to raise money for TAC transportation by drawing the lucky ticket for the 1929 Ford Model A car OR $5,000 cash raffle Sunday evening at The Auction Connection event. Rich Rigsbee of Springfield was the grand prize winner. He chose to keep the donated early restoration car. Second prize ($1,000) was won by Janie G. of North Hampton. Ten third-place winners included Connie G., Rich R. X2 (he returned the cash prizes to TAC), Brian H. of Springfield, John H. of Urbana(X2), David J. of Blandon, PA, Jeff K. of Fairborn, John M. of Hermitage, TN and Greg G. of North Hampton. “After payout, proceeds from the raffle go to our 2018 fundraising goal of approximately $80,000 for improved transportation services,” said TAC CEO Justin Debord. Multi-passenger transportation vehicles are needed to transport people with disabilities to work, activities, and events.